NETWORK FINALS: The only adjustment from early numbers was a 0.1 boost for the BOB’S BURGERS rerun. CABLE HIGHLIGHTS: It was a busy night for pay-TV. On HBO, the final season of THE LEFTOVERS launched at 0.39, down 0.09 from its last season finale, but up 0.06 from the Season 2 premiere; the series finale of GIRLS rose 0.02 to 0.35; VEEP returned with a 0.27 season premiere that was down a big 0.25 from the 2016 premiere (albeit on a night elevated by GAME OF THRONES); and LAST WEEK TONIGHT rose 0.02 to 0.43. On Showtime, GUERILLA premiered with an awful 0.06/182K that didn’t even hit the chart, although it didn’t hurt BILLIONS, which ticked up to 0.29. Starz premiered THE WHITE PRINCESS at an OK 0.16. Sunday cable was dominated by TNT’s NBA PLAYOFF games at 2.20/2.12/1.04 (led by Oklahoma City vs. Houston). On Bravo, REAL HOUSEWIVES OF ATLANTA edged up 0.02 to 1.12, and REAL HOUSEWIVES OF THE POTOMAC was down 0.06 to 0.66. Food Network launched IRON CHEF GAUNTLET at 0.64, IRON CHEF EATS at 0.39/0.32, and LEGEND OF IRON CHEF at 0.34. 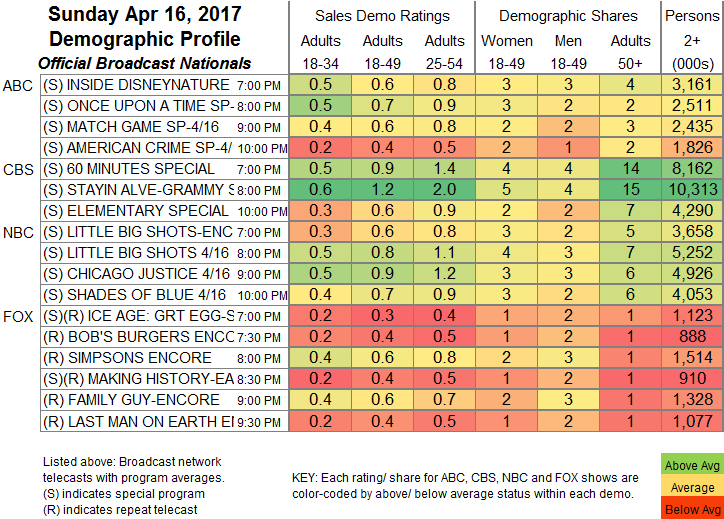 Discovery’s NAKED & AFRAID was steady at 0.63, with a post-show at 0.48. E!’s KEEPING UP WITH THE KARDASHIANS lost 0.05 to 0.57. ESPN’s MLB SUNDAY NIGHT game was at 0.48. On TLC, LONG LOST FAMILY held at 0.37, WHO DO YOU THINK YOU ARE jumped a tenth to 0.36, and LONG ISLAND MEDIUM was down 0.06 to 0.27. ID’s SCENE OF THE CRIME was at 0.35, and DISAPPEARED was at 0.32. USA’s BEVERLY HILLS DOG SHOW special was at 0.13. On AMC, TALKING WITH CHRIS HARDWICK fell a tenth to 0.12, and COMIC BOOK MEN was down 0.03 to 0.08. 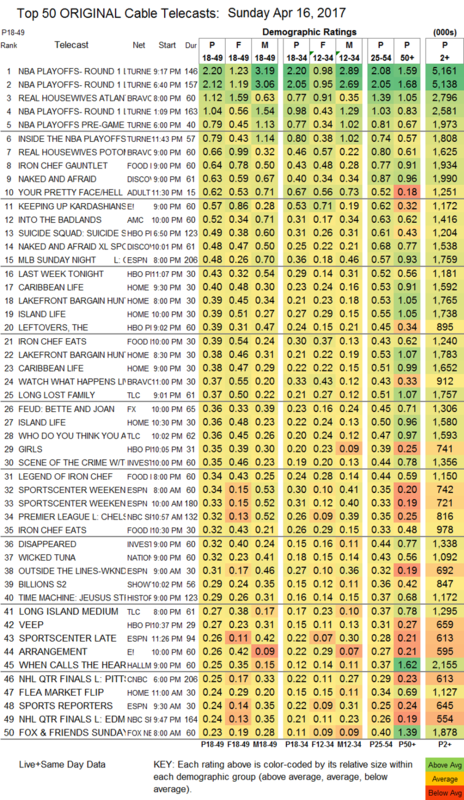 The non-pay side of scripted was led by Adult Swim’s late-night YOUR PRETTY FACE, up 0.06 to 0.62. AMC’s INTO THE BADLANDS stabilized after last week’s plunge, down 0.06 to 0.52. FX’s FEUD rebounded from last week, up 0.08 to 0.36. E!’s THE ARRANGEMENT slipped 0.02 to 0.26. Hallmark’s WHEN CALLS THE HEART was steady at 0.25.